This is not a Glen-Mor Restaurant recipe. We learned braided sweet bread at our week-long King Arthur Flour bread class last Fall. Combine sugar, yeast, salt, and 3 cups flour in a large mixing bowl and stir to combine. Lightly beat 2 eggs in a small bowl. Add warm water and butter, stir to combine. Pour wet ingredients into the large mixing bowl and stir to combine. Slowly additional flour and mix until the dough forms and pulls away from the side of the bowl. Generously sprinkle flour on countertop and turn-out dough to knead. Knead for 5 minutes adding flour to prevent dough from sticking to hands and the counter. Dough is ready when is springs back quickly if pressed with a floured finger. Transfer dough to a clean bowl coated with cooking spray. Cover with plastic wrap and place in a warm place until double in size, about 1 hour. After dough rises, turn out dough on flour-dusted counter and push out the air. Cut in half and cover half with plastic wrap. Cut remaining dough into four or six equal pieces. Roll each piece into a 12-inch long piece and set aside. Press pieces together and braid as desired. Repeat with second section of dough to create two braids. Place braids on a greased baking sheet. Cover both braids with plastic wrap, and let rise until doubled, about 1 hour. Preheat the oven to 375°F. Separate the remaining egg and combine the yolk and 1 Tbsp. water, beat lightly with a fork. Remove plastic wrap and brush the braids lightly with the egg wash.
Bake braids for 30 minutes, or until bread is golden brown. Internal temperature should be 190°F when done. 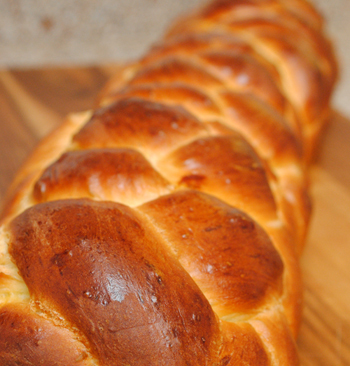 Cool braids on a cooling rack and serve with butter or Raspberry Jam.